How to beat roulette: explanation of some key points that could help you to increase your chances to win online, learn how to play reasonably. 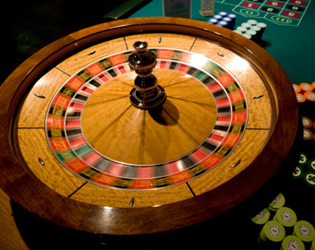 It is widely considered that roulette is a game of luck but there are still some methods and tricks which could teach players how to beat roulette. There is no magic and most of such roulette tips are tightly connected to perfect knowledge of roulette rules and their correct application. In this section we would like to introduce you some most useful of them. The first advice that is usually is given to all roulette newbies is to choose European roulette instead of American roulette version. Although both online and land-based casinos usually offer European game as well as American one, the first roulette variation implies essentially higher payoffs (in long run especially). This point is explained with the fact that European roulette has only one single zero position while American game is designed so it provides an additional double zero pocket on its wheel. This difference is really significant in terms of gamblers' payouts as extra zero slot increases the house advantage over players proposing higher casino odds of roulette. You could be easily confused with the highest payoff that is related to single-number or straight-up bets, but it is worth to remember that this kind of stakes also offers the lowest probability of wins. This fact is clearly observed if you calculate the odds for straight-ups and compare their values with corresponding odds for other bet types. It is considered that the cleverest way of betting is to make even-money bets which are associated with the lowest house advantage. In order to get a pleasure of the game it is advisable to divide your initial funds into some parts and bet them gradually. This will extend the time you play roulette and increase your chances to win due to the fact that you could make more bets. If you are not extremely lucky or have not settled a deal with the Devil, it is just silly to spend your whole bankroll in one session relying only on luck. In case you win some amount it would be better if you put it in a whole or, at least, part of it, aside. In such way you could refrain yourself from total bankruptcy. Train your skills and knowledge in free or trial applications of roulette. Before trying something new and not quite understandable it is worth to examine how a particular roulette game variation is performed, what the specific rules are and reveal all possible pitfalls before you become confronted with sudden difficulties as many excited greenhorns do. The source of the highest risk that gamblers are jeopardised while playing roulette is hidden inside the players themselves. It is not advised to chase your losses or settle the goal to beat the house, because such strategy could lead you to total failure very quickly. It would be much better if you just relax, play the game, enjoy it and have fun. Is not this the reason why you have started gambling at all?